Alright my foodie friends! I have just learned of another BBQ technique that originates in Germany known as schwenker. 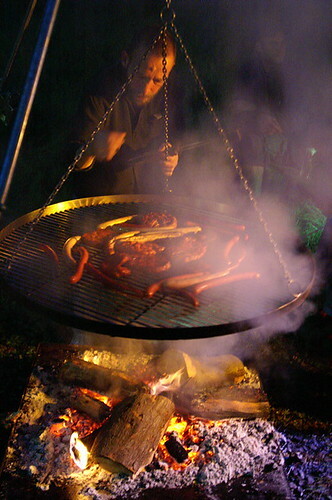 Essentially, pork that has had a long marinade in onions and wine is direct-grilled over a wood fire (traditionally charcoal and grape vines). However, the grill is suspended from a tripod by chains and is kept in motion throughout the cook for even heat. I am excited to give this a try! Here is my challenge to you: try schwenker for the first time, document it with pics or video on a sharing network like Flickr or YouTube and send me a link. I will link to the best ones here. Mix the ingredients together in a container, and refrigerate for three days. Cook on the schwenker (tossing the onions and herbs on the grill as well), ideally over a grape vine fire, until done to your liking on each side. * from Anne Junglen of Zeltingen, Germany, originally published by NPR. This entry was posted in German, Pork, Recipes, Region and tagged BBQ, charcoal, cooking, cookout, Deutschland, Europa, Europe, food, German, Germany, grape vine, grill, how-to, pork, Saarland, Schwenker. Bookmark the permalink. 1 Response to Schwenk The World! I’ve picked up supplies to make what I hope will be a simple and successful schwenker. If possible, I will post materials & directions for construction. I hope that will persuade some people to give it a try?